A wraparound style, this adjustable nylon dog harness that reduces pressure on the throat and made from recycled P.E.T (water bottles). Stylish and earth friendly! 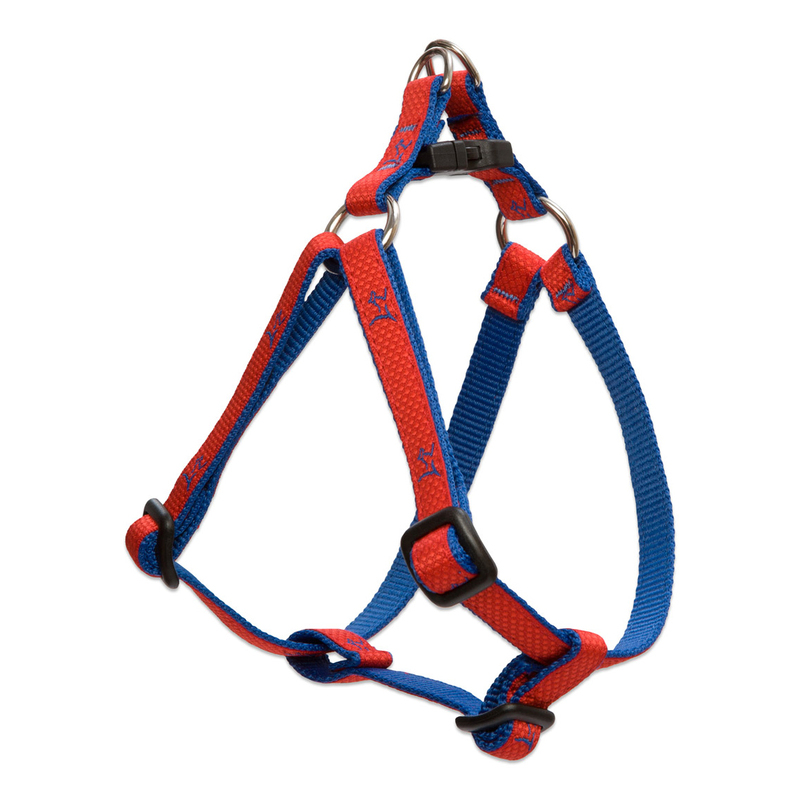 The design makes the Lupine dog harness easy to put on and take off and an adjustable sternum strap ensures a perfect fit. The lead is attached to both D-rings. 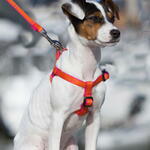 All harnesses come with the unique Lupine 'Even-If-Chewed’ Guarantee® and are machine washable. 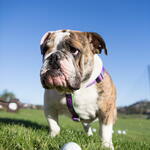 You can order a pet ID tag to perfectly match any pattern offered for this product. Just check out our Lupine Pattern category to find a matching tag. Available in 1/2", 3/4" and 1" widths and sizes 10"-13", 12"-18", 15"-21", 20"-30", 12"-20" and 16"-28". Prices vary by width and girth. Buckle - Convenient and strong. Lupine and YKK, the leading buckle manufacturer, have come together to design the highest quality, strongest plastic buckle on the market. Designed specifically with pets in mind, this buckle consistently tests stronger than even metal buckles and features an easy, convenient side release. D-Rings - Strength where you need it most. Lupine’s welded steel D-ring is rust resistant and designed to hold up to years of heavy use. O-Rings - Rust resistant steel. Made of the same high quality rust resistant, welded steel as our D-Ring. 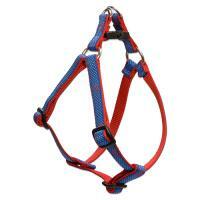 Used in our harnesses so that the webbing lays flat and provides the most comfort and best fit for your dog. Stitching - Every fiber matters. Lupine utilizes the bar tack commonly used in mountain climbing products where superior strength is crucial. 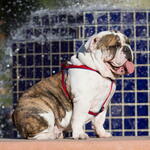 Webbing - Beautiful and long lasting. Lupine webbing is of the highest quality jacquard nylon. 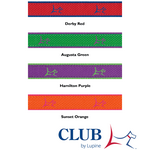 Never printed or ribbon overlay and tested for color fastness, you can expect your Lupine webbing to withstand the rigors of time, your washing machine and of course, your dog and still look fabulous year after year! Tri-Glide - Adjusting made easy. The non-slip teeth molded into the nylon plastic tri-glide keeps the collar at the correct size even with the strongest of pullers.